This triangle is precisely what China and Russia are doing now. Russian oil & gas is being sold for Chinese Yuan, and then Yuan is traded for Gold at the Shanghai Gold Exchange. The trade is not complex at all. Oil for RMB for Gold, creating a transaction payment in gold terms. The part unclear is posted margin to confirm and seal the transaction. The immediate implication is that the Chinese RMB will have a quasi-gold link. The original model used might have been the Iranian oil sales to India, with payment completed using Turkish gold. Such gold for oil trade appears to have been commonly executed from 2006 to 2010, and likely beyond that date. The Jackass has been expecting that the Gold Trade Note would be structured in a clever way, using swap contracts in major global commerce. It might be taking form in the triangle cited as the working template. Oil is the biggest commercial trade item. Soon comes the RMB-based contract for crude oil, traded in Shanghai. It will surely cause big waves, a major disruptive event. 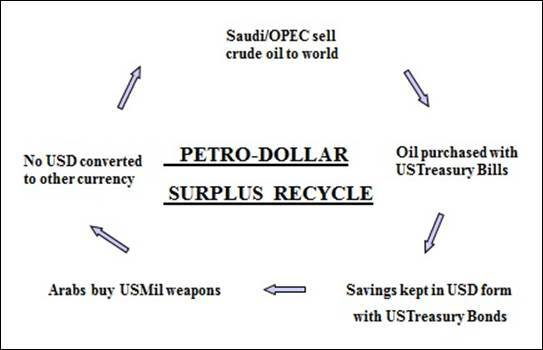 The Petro-Dollar system has stood for 45 years. It has decayed into tatters. Its derivative foundation is being liquidated, a long painstaking process. A new disruptive model was forged in 2014 when Iran sold India oil, which was paid in gold, but delivered from Turkey. 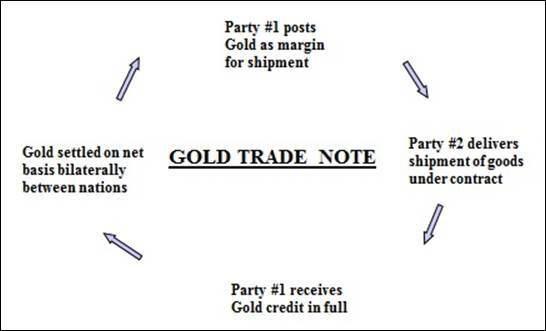 Gradually emerging is the Gold Trade Note, first in oil payment then later in general payments in shipped goods. It is evolving within the Chinese market from Russian energy sales, all conducted outside the USDollar sphere. Examine the many components for the demise of the Petro-Dollar, the fading importance of the USTreasury Bond, the chronically supressed Gold market, and the emerging structure of the oil trade among the Eastern superpowers. Grant Williams lays it out in wonderful style in a recent Zero Hedge article, truly great work. See Zero Hedge (HERE). Take it one step further. The Russians as primary oil producers have the ability to sell oil in RMB terms, accept the Chinese currency and purchase gold at the Shanghai Gold Exchange. Soon the Chinese can better organize their oil purchases from other nations. The vendors can turn around and do the same, convert the RMB into gold in Shanghai. The Petro-Dollar has been effectively replaced with the mechanisms of a Petro-Yuan erected on the Gold table. The Chinese are putting in place a link between oil and gold, once again like before the Bretton Woods Gold Standard was violated by Nixon in 1971. The Gold Standard is emerging, with respect to the oil market. The next step to standardize the entire global commerce with gold payments can be fashioned in much the same way. The Gold Trade Note is coming into view, carved and sculpted by Chinese hands within the transacting of Russian oil. In time, ships bearing containers and dry goods will be paid in gold terms. It might be done with the RMB in intermediary function, but the conversion to gold will be everpresent soon. The USTreasury Bond in its entirety is being deeply contaminated by the QE hyper monetary inflation programs that have damaged the USD integrity for six years running. The Gold Trade Note will serve as the all-in-one contract, the efficient omnibus contract which will gain global acceptance. It is important to step back, to observe the key pieces to the puzzle, to notice the decayed elements, to notice the new fortified elements, and to make conclusions on the direction of the path, which ultimately will lead to the Gold Trade Note. It will be used initially to make payments for massive oil shipments. Later it will be used to make payments for massive container vessels, and for what are called dry shipments (like cement, grain, lumber, ore). Finally it will be used to make payments for construction projects and service contracts. The Gold Trade Note is en route to supplant and to replace the USTreasury Bill within the global payment system. The USDollar has been incredibly abused, with monetary printing used to cover USGovt deficits, to redeem toxic bonds held by Wall Street banks, to justify the US trade deficit, and to finance endless wars. Given the USDollar role as global currency reserve, the USDollar abuse cannot stand much longer. Its days as King Dollar are very limited. Examine the components in key events. PETRO-DOLLAR SYSTEM HAS BEGUN TO BREAK DOWN. 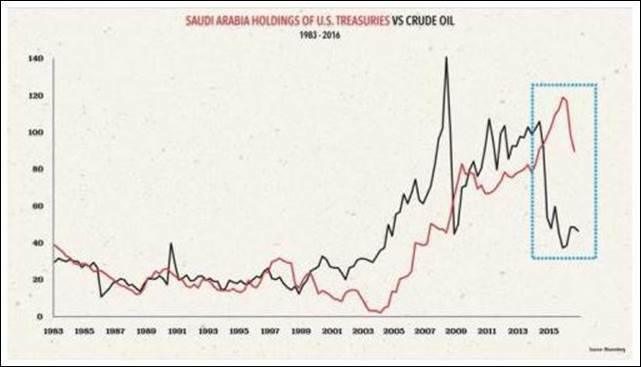 The correlation between the Saudi USTreasury holdings and the crude oil price has broken down. The inverse correlation between the USDollar currency index and the crude oil price has broken down. This chart, like the others to follow, is from Grant Williams and his fine work. USTREASURY BONDS HAVE BEGUN TO LOSE THEIR STORE OF VALUE. Since the 1970 decade, the total foreign holdings of USTreasurys went from near nothing to over $6 trillion in the span of over 40 years. Nations needed to hold big quantities of USTBonds and USTBills with which to purchase crude oil. In the last three years, foreign FOREX reserves have been gradually in decline. The reasons are many, such as falling oil price, falling commodity prices, global recession, and disgust for USGovt fiscal policy and for USFed monetary policy. A GRAND BACKFIRE OCCURRED IN RESPONSE TO THE IRAN SANCTIONS, WITH BARTER TRADE. Starting in May 2012, Iran began to sell a portion of its energy products to China for RMB currency, bypassing the Petro-Dollar entirely. In turn Iran used the RMB to purchase Chinese goods and services. The trade was worth around $25 billion per year. China then decided on a policy shift, no longer to accumulate FOREX reserves, with the finger of toxic blame pointed at the USGovt. The great reduction of USTBonds had commenced. Iran and China had begun their barter trade. 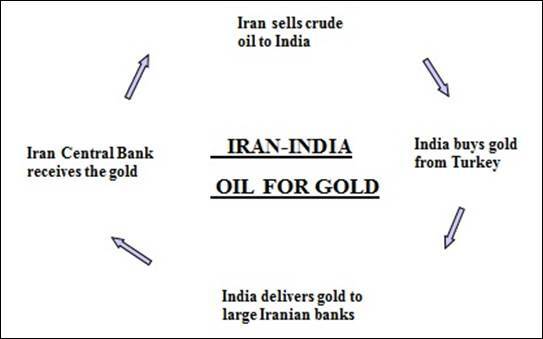 THE IRAN BACKFIRE AMPLIFIED WITH THE INDIAN OIL FOR GOLD SALE. Regional neighbor India agreed to purchase Iranian crude oil in 2014. The deal was clever, and sidestepped the blockheaded Obama Admin sanctions. India bought the oil, but paid with gold bullion acquired from Turkey. The gold was delivered then to the large banks in Iran, which were not subject to restrictions. Only the Iran central bank was under restrictions. Crude oil was sold on a large scale basis, with no USDollars in the transactions. With barter and the oil for gold sales, the elements were coming into shape for the Gold Trade Note. The nefarious bullies in Washington had been outwitted while giving the death sentence to the Petro-Dollar, and a death warrant to the USDollar. THE RUSSIAN OIL TRADE WITH CHINA WAS THE RESULT OF THE UKRAINE WAR, WHILE SHANGHAI SET UP SHOP WITH THE GOLD EXCHANGE. Consider it another gigantic backlash from yet another illicit war. The USGovt and Israel kicked off the fascist coup in Kiev Ukraine, but the joke was on the Petro-Dollar, again a victim of severe blows to the groin. The Russians began both massive oil & gas sales with China, paid in RMB, but also energy pipeline construction to connect the two Asian nations. The construction would be paid in USTreasurys held by China. The great dumping had begun in earnest, called Indirect Exchange since third party cash was used. NEXT CAME THE INTRODUCTION OF THE SHANGHAI GOLD EXCHANGE. Despite its limited price impact, the global gold flow chart has undergone radical change. Already, places like Tokyo, Seoul, and Dubai are opening physical gold markets. They strive to link their nascent markets for bullion to the Shanghai exchange which has rapidly become the largest physical delivery market in the world. A CONFLUENCE OF EVENTS LED THE SAUDIS TO HASTEN THEIR SYSTEMATIC SALE OF USTREASURYS. The Saudi income stream was reduced by the sharp decline in the oil price. Their war spending with the Yemen War also escalated, the hidden motive being to replace rapidly declining Saudi oil reserves. The kingdom had to dump USTBonds in order to finance their deficit. They even began to issue bonds for sale to foreigners, a first event. Then in summer 2016 the USCongress saw fit to permit lawsuits against the Saudis for their role in the 9/11 attacks. They had no role, but the USGovt insists on creating scapegoats to cover the insider fascist role in the event, which was a gigantic bank heist at the World Trade Center. The upshot was that the Saudis accelerated their USTBond sales. The Petro-Dollar was being dealt a series of deadly blows, with the Arab monarchies all under great financial strain, the deep deficits the common factor. IN THE LAST 40 YEARS, THE FOREIGN HELD USTREASURYS WENT INTO OVERDRIVE. The total foreign USTBonds grew to multiples of global oil output value. 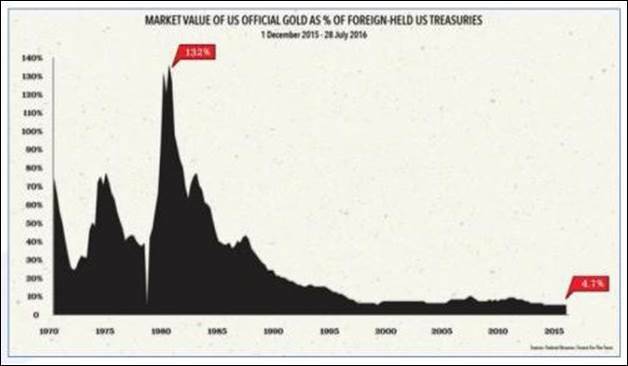 Meanwhile from the opposite perspective, the official (mythical) USGovt gold reserves became dwarfed by the gigantic volumes of floated USTBonds in global cupboards. During the Reagan Admin, USTreasurys were backed 132% by the market value of the country’s gold reserves. Today, the amount has fallen to 4.7% only. The globe is awash in toxic USTreasurys, the infamous black hole often cited in the Hat Trick Letter. Demand has dried up for USGovt debt securities. Thus the advent of QE by the USFed, the phony demand, the US-based central bank buying the USGovt debt. Witness debt monetization, Third World style. THE MAJOR SURPLUS NATIONS ARE ACCUMULATING GOLD BULLION, AS THEY ESCHEW THE USTREASURYS OF PAST FAVOR. Russia has been adding to its official gold reserves, selling off their USTBonds during the conflict over Ukraine. In doing so, Russia fortifies its Ruble currency with actual hard assets, namely gold. Also, China has been adding to its official gold reserves, under similar circumstances. A key switch can be noted. During the first seven months of 2016, China imported about 30.5 million metric tons of Saudi oil, a 0.4% decrease over the previous year. By comparison, China imported about 29.5 million metric tons of Russian oil as an impressive 27% increase over the previous year. China moved toward the Russian energy embrace, while both nations added to their gold reserves. IN THE OIL MARKET, THE CHINESE ARE TAKING STEPS ALSO, JUST LIKE WITH THE SHANGHAI GOLD EXCHANGE. China has moved to become the #1 oil importer globally, overtaking the United States last October. They are working on creating an RMB-based oil contract which would compete against the West Texas and Brent contracts, even the St Pete Russian contract. The delays continue but the outcome is written. Williams surmises that the strong oil price decline in the last two years indicates that crude oil is in the process of being priced in gold terms. Availability of gold in Shanghai has changed the paradigm. The pendulum that swung hard for over 40 years is about to swing back in the other direction. Consider the three major asset classes, namely gold, oil, and USTBonds. With an annual production of $170bn, gold is by far the largest metal market by value. However, that figure is overwhelmed by the oil market which is 10 times larger at $1720 billion, on an annual production basis. The USGovt in collusion with the USFed produce a ripe $1200 billion each year, plus another $400 odd billion in covered redemptions. The paper asset is in huge abundance, if not a global glut. Such is the nature of the USTreasury Bond black hole. The conclusion is simple, that the gold market is under-valued, that the gold price suffers from a scarcity in value. The New Scheiss Dollar will arrive in order to assure continued import supply to the USEconomy. It will be given a 30% devaluation out of the gate, then many more devaluations of similar variety. The New Dollar will fail all foreign and Eastern scrutiny. The USGovt will be forced to react to USTBill rejection at the ports. The US must accommodate with the New Scheiss Dollar in order to assure import supply, and to alleviate the many stalemates to come. The United States finds itself on the slippery slope that leads to the Third World, a Jackass forecast that has been presented since Lehman fell (better described as killed by JPM and GSax). The only apparent alternative is for the United States Govt to lease a large amount of gold bullion (like 10,000 tons) from China in order to properly launch a gold-backed currency. Doing so would open the gates for a generation of commercial colonization, but actual progress in returning capitalism to the United States. The cost would be supply shortages to the USEconomy, a result of enormous export increases to China. Even if the USGovt can secure such a large hoard of gold, like from Bush Family and Rubin Clan seizures of stolen Fort Knox gold reserves, the United States will be vulnerable from a $550 billion annual trade deficit. Its settlement after one year would exhaust all 10,000 tons, since at $1300/oz, such gold tonnage would be worth $420 billion. The United States is truly trapped in an economic insolvency situation, with inadequate industry and a huge unresolved trade deficit. Failure to produce a legitimate bonafide gold-backed currency, together with an adequate industrial base, would mean the United States will be confronted with a real big nasty currency crisis. Any new currency, even with gold backing, would be subjected to a series of devaluations due to the enormous trade deficit. The result would be heavy powerful painful price inflation from the import front. The effect would be to reverse a generation of exported inflation by the United States. The entire USEconomy would go into a downward spiral with higher prices, supply shortages, and social disorder. However, the rising prices would come from the currency crisis, and not so much from the hyper monetary inflation. That flood of $trillions has been effectively firewalled off. During the crisis that comes, the gold price will find its true proper value between $5000 and $10,000 per ounce. Then later, it goes higher, as it seeks equilibrium in a new world where gold serves as the global arbiter in trade and banking and currencies.